Cooking in the dorms is hard, but not impossible. There are so many aspects of cooking and resources I used to have that I completely took for granted. For instance, at home we were always stocked with basic ingredients like butter, olive oil, garlic, onions, salt, pepper, etc. In college, however, I have no use for a full head of garlic or stick of butter and almost never need a full yellow onion to cook for one, so I rarely have them on hand. 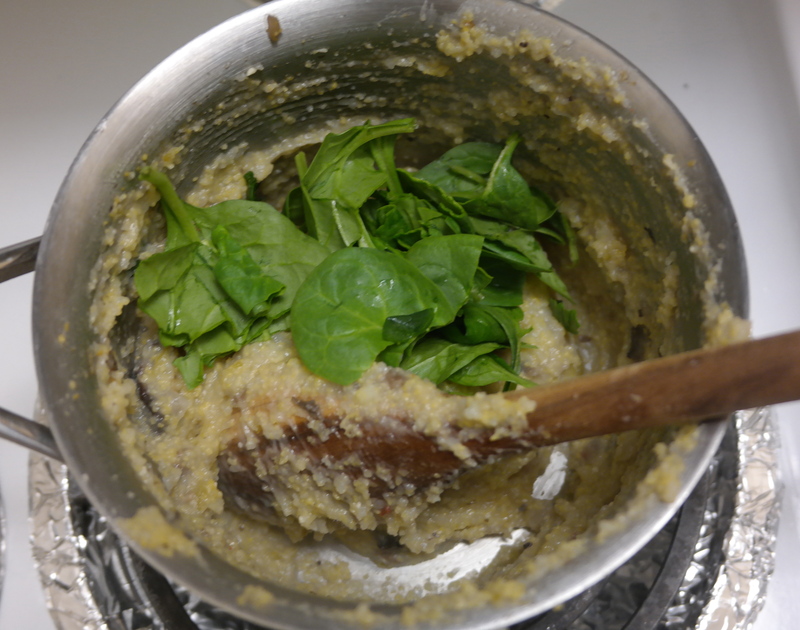 Ingredients in general are hard to stock up on, because I refuse to waste food and good ingredients tend to go bad before I am able to finish them. Enter the dining commons. Dining commons, I’ve discovered, are a treasure trove of those every day ingredients I used to take advantage of. Onions? No problem, the salad bar is always stocked with sliced red onions. Butter? No problem, there are sliced AND individually packaged bits of butter next to the bagels. Can’t finish a bag of spinach before it goes bad? Again, salad bar. 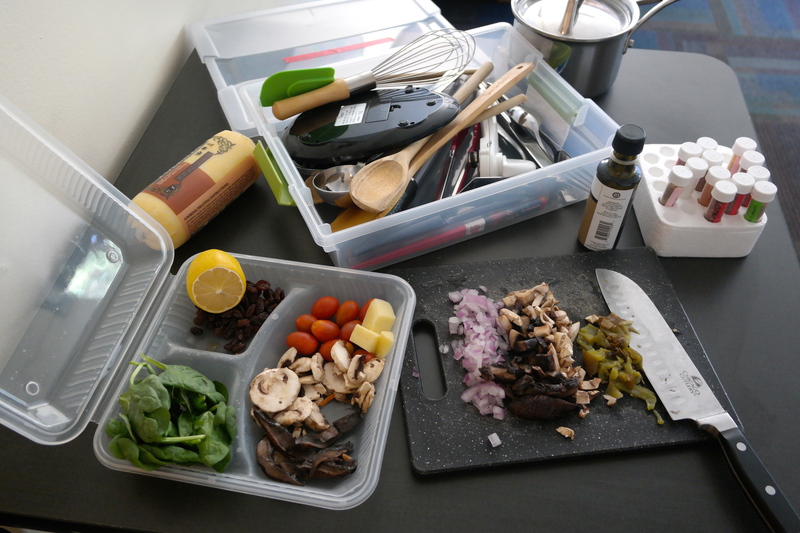 So, about once a week I take many little tupperware containers to the dining commons, and stock up on ingredients. I am also very fortunate because my college has this program called “farm to fork”, where one section of the salad bar is dedicated solely to ingredients grown at student farms on campus. 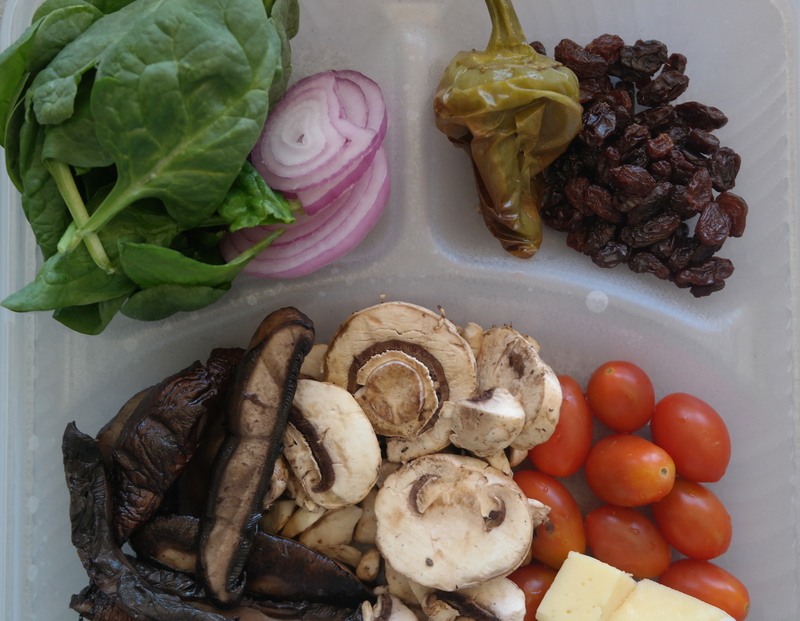 This section is usually a treasure trove of seasonal ingredients, so this recipe features some roasted jalapeños and portobello mushrooms from the student farms. 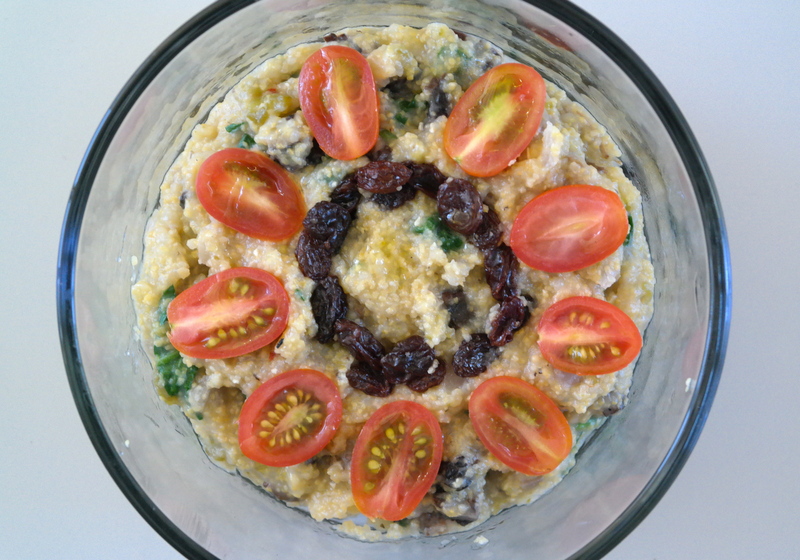 For this recipe, all I bought was some polenta from Trader Joe’s and supplemented the rest with ingredients from the salad bar — so very college friendly and cost effective!! 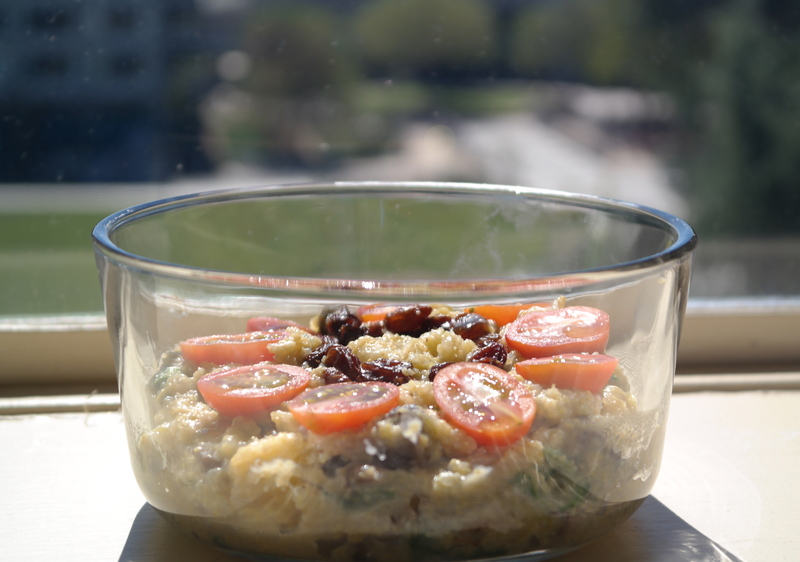 This dish was also super easy to make and can be easily modified to any ingredients on hand. 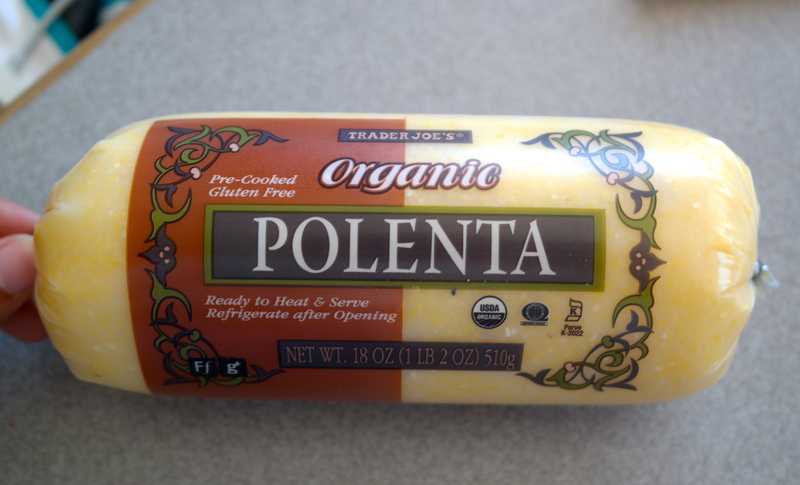 The polenta serves as a great, hearty base for the meal and is a cheap/flexible ingredient to keep stocked in your fridge! I took a picture of my set up for dorm cooking because I thought it was pretty amusing. I have a box of basic utensils (wooden spoons, spatulas, tongs, knives etc. ), a few essential pans, one cutting board, and a spice rack made from mini (unused) containers taken from my mom’s lab filled and labeled with spices from our pantry. Our dorm kitchen has absolutely no counter space, so I end up prepping everything on the common room tables before hand. This cooking set up is definitely a little ‘rustic’ and unconventional, but, honestly, the added challenge adds to the fun of it all and makes the end result all the more satisfying. I encourage all of you college freshmen to swipe some ingredients from your dining halls, because the 30,000-60,000+ dollars you are paying a year warrants a few stolen tomatoes here and there. 1. 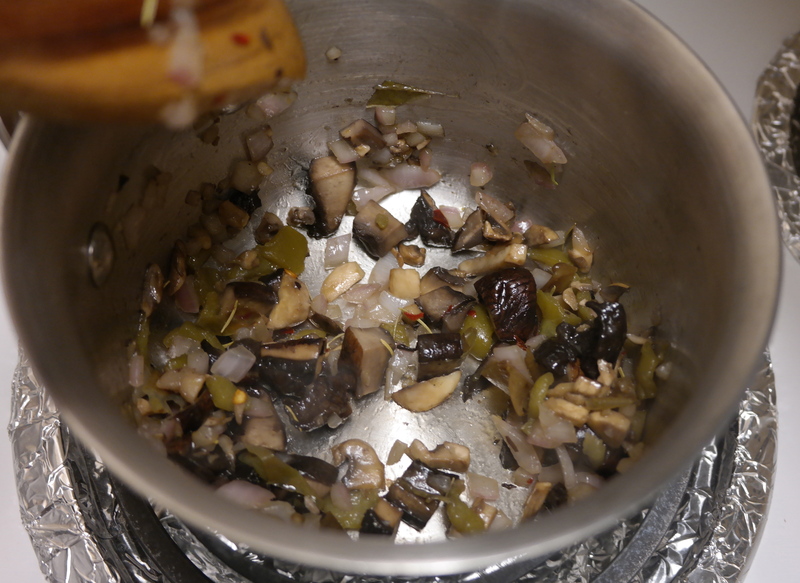 In a small pot, heat ~1 Tbs olive oil and add onions, mushrooms, and jalapeño (if using). Season with salt, pepper, red chili flakes, and ~1/4 tsp dried rosemary. Saute until onions are translucent and beginning to caramelize.